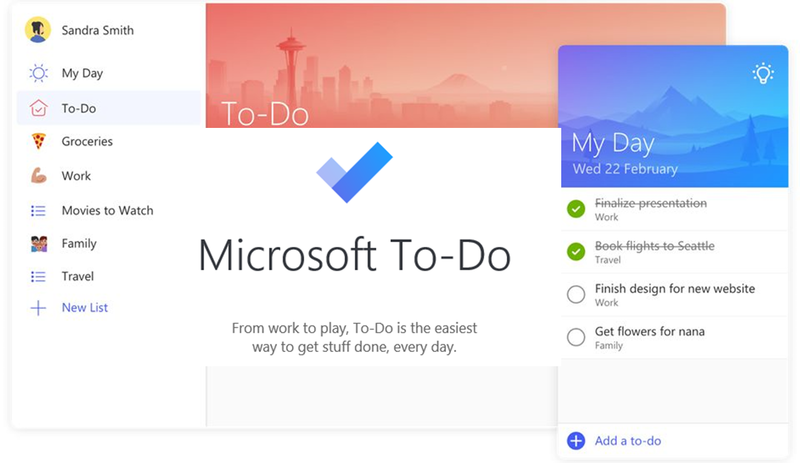 Microsoft To-Do now available in Preview! – CT Link Systems, Inc.
Microsoft To-Do now available in Preview! Microsoft introduces a new intelligent task management app (available in Preview) named Microsoft To-Do to help plan and manage your day-to-day activities. Coming from the team behind the Wunderlist app, To-Do delivers a smarter and more personal and intuitive way to keep you organized while helping you get the most out of each day! Powered by Office 365 integration and its intelligent algorithm, it is Microsoft’s first step into helping its customers simplify their task management to help them achieve more. With To-Do, you can create lists for anything, be it for work, home projects or just your own groceries! Be able to track deadlines by adding reminders, due dates and notes while being able to personalize each list with different themes. Accessibility will not be a problem as the To-Do app is available for the iPhone, Android phone, Windows 10 devices and even on the web! Admittedly, there are times that managing your to-do list can take as much effort as completing them. To-Do helps you focus and plan your day by starting with a clean state when you first open your app, allowing you to be more intentional on what you want to get done. Another feature, Intelligent Suggestion, can help you get an idea on which tasks should be prioritized by showing you your to-dos the day before, showing you your task dues or upcoming tasks and other helpful suggestions based on the smart algorithm. With To-Do being built on Office 365, it will, in the coming months, enable the product to become even more useful to its users. One integration is with Outlook, which will allow users to sync their Tasks with To-Do to allow them to stay on top of their Outlook Tasks from anywhere, managed across devices. As the only task management app built on enterprise cloud, To-Do offers advanced security that Office 365 customers expect. Get Microsoft To-Do Preview for iPhone, Android, Windows and the web today! ← VeloCloud’s Official Product Launch in the Philippines!